Gold with opalescent clear sequins (color is Champagne). Size 6-7 (Small). (Partial petticoat crinoline already built in. Unveil that Hollywood style with this spectacular new A-line gown. Authentic Tiffany Princess Ballgown. You will be getting the gold and black dress in the first image). NWOT Joyfolie Mia Joy Special occasion Dress. This is for the dress only. Machine wash; tumble dry. IT HAS GEMS AROUND THE NECK AREA. IT IS SHIFT DRESS. THIS IS A NICE DRESS. 56% POLYESTER. COLOR: GOLD. TOP TO BOTTOM: 27 1/4 ". IT HAS OVAL PRINTS. MADE IN THAILAND. Kate Mack Good As Gold Tulle Dress. 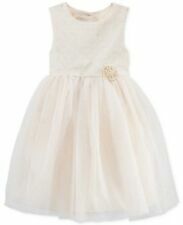 Soor Ploom NWT Josie Dress Pencil No 2 size 6/7 - final reduction in price. Retail Value 142. 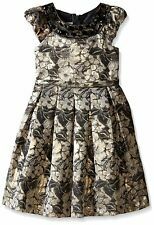 Soor Ploom NWT Josie Dress Pencil No 2 size 6/7. Condition is New with tags. Shipped with USPS First Class Package. NWT cap sleeve pink&gold dress! Gorgeous! Dollcake Sienna Couture dress size 5 NWT (great for parties). Condition is New with tags. Shipped with USPS First Class Package. Girls' Jacquard A Line Dress - Cat & Jack Gold. Girls' size X-Large 1 4/16. New Gianni Bini GB Gold Floral size 16 Party Dress Sleeveless Shiny. Giani Bini Girls. GB girls Size 16 Fall/winter White And Gold Floral Dress. NWT. Condition is New with tags. Shipped with USPS Priority Mail. Crewcuts by J Crew. - Beautiful Silky Floral Dress. - Gold Copper Color with Pink Trim. - Gold Zipper Trim at Back. - Drop Waist with Full Twirl Skirt. 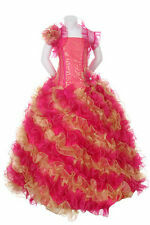 - Girls Youth Size 10. 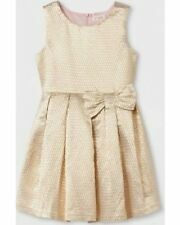 Girls' Jacquard A Line Dress - Cat & Jack Gold. Girls' size Large 10/12. Emily West. Skirt of dress has a crimp under it so it really "poofs" out, Dress really sparkles. It's a cream color and gold. Girl's size 7. Gorgeous Special Occasion Dress. Adorable holiday girls dress by Cat & Jack (Target). Cream and gold “crochet” fabric, lined. From a non smoking home, we do have one dog. No returns. Hanna uses soft 100% cotton in a jersey knit to create a dress that is cozy and stylish! It has an A-line silhouette, long sleeves, two front patch pockets, and a screenprinted design that peeks out of the right pocket.